What is a femoral-tibial bypass? Femoral-tibial bypass is a type of surgery. It redirects blood around blocked blood vessels in your lower leg or foot. It is often done if you have pain. Or it may be done if you have foot sores caused by circulation problems. Your doctor will use something called a graft to make the blood go around (bypass) the blocked part of your blood vessel. Often the graft is a vein taken from another place in your leg. But sometimes it is a man-made blood vessel. 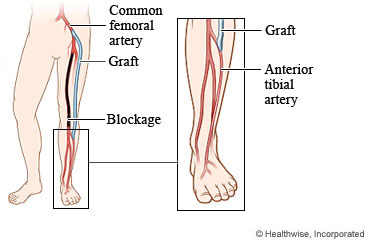 The graft will carry blood from the femoral artery in your groin to the tibial artery in your lower leg or foot. You will be asleep during the surgery. Or you will get medicine to numb your lower body and prevent pain. The doctor will make cuts in your skin above and below the blocked blood vessel. These cuts are called incisions. If one of your veins is being used for the graft, the doctor will make another incision in your leg to take out the vein. Then the doctor will attach one end of the graft to the femoral artery and the other end to the tibial artery. After the graft is in place and blood is flowing through it, the doctor will use stitches or staples to close the incisions. You will have scars, but they will fade with time. You may need to stay in the hospital for 3 to 5 days. It may take 6 to 12 weeks to fully recover. You will be kept comfortable and safe by your anesthesia provider. The anesthesia may make you sleep. Or it may just numb the area being worked on. Enter J345 in the search box to learn more about "Femoral-Tibial Bypass Surgery: Before Your Surgery".